“I notice that it is only when my mother is working in her flowers that she is radiant, almost to the point of being invisible except as Creator: hand and eye. She is involved in work her soul must have. Ordering the universe in the image of her personal conception of Beauty. It’s that time of year again, a good many of us down in the dirt and dreaming big. As usual when my knees hit the mud for this first time, I long to have my grandmothers back. I’d settle those two hard-working, Midwest anchors of my childhood on lawn chairs in the middle of my freshly turned beds, the ghosts of my past surrounded by the fantasy of the yield to come. 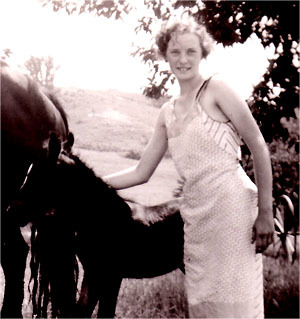 My father's mother at age 16 on the family farm, hands dirty from work. She moved to the city after she married. I miss those ladies. Once my hands are free to dig—no writing on the computer, no marking papers or editing, no doing anything but going into the earth–the grief I store up in pockets all winter comes out. I hack at those weeds in a way that feels personal. The earth gets a good beating, and the scent and feel of soil takes me back to when I was small and left to dig and make mud in yards where there was always somebody nearby. Ours was a raucous and constantly shifting network of siblings, mothers, fathers, aunts, uncles, cousins and grandparents. I must have assumed it would always be that way. What I wouldn’t give to look up from setting in new seeds and be able to ask those two matriarchs, “What did you do with your hands that made you truly happy?” I honestly have no idea what they would say, and not knowing that about them seems like the saddest thing. My youngest planting nasturtiums with me. She likes arranging the seeds. We feel close to people when we see or experience what they create. Every day I ask my children, “What do you want to make?” I sign them up for painting or dancing or piano lessons. I look for their personalities and their futures in what they love to do. My students and friends are always deep inside some process or another, writing, painting, building. The meals we make for each other are lovely and exotic, the wine discussed as if it were a poem. We love people for what they do for others, but we fall in love with them based on what they do for themselves. My grandmothers did not romanticize gardens or knitting or any of the “hobbies” I indulge in when I am not tapping my lily white and pampered fingers on the keyboard. (That I write and read other people’s writing for a living would amuse them.) After marrying my grandfather and leaving the family farm, my father’s mother worked the line at General Motors for 28 years. She dipped her fingers in motor oil, lifting and sorting car parts until she ached. She did get to wear plastic gloves though, so no stains. My mother’s mother had hands abraded and veined from heavy kitchen work and tending children. Her right pinky finger was crushed permanently flat after she caught it in the wringer washing machine. My grandparents made the bulk of their livelihoods from building and repairing automobiles. They planted flowers along the edges of their yards, usually petunias, sweet williams or begonias, and that was that. Theirs were simple homes with little art or time for it. There were too many people to feed and clothe and keep healthy. My mother's mother spent five years on this spread, working at it when she had time. 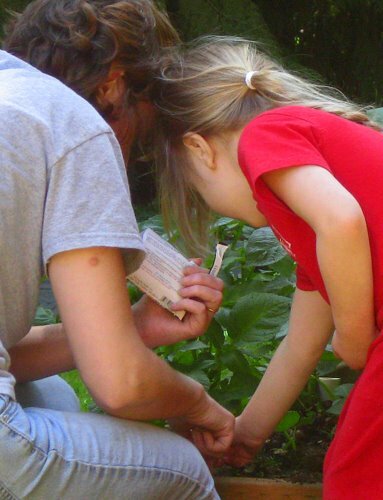 I imagine my grandmothers–one tall and lean, the other soft and round–in my Oregon yard, pointing out a weed I missed and getting a kick out of the things my kids say. I miss the good natured teasing and oft repeated stories that both women resorted to in order to keep the multitude of their descendents in our places while at work on some necessary job or another. They both liked to laugh, my mother’s mother hunched over with her hands on her knees, my father’s mother with her head thrown back, whooping. It was impossible not to join in when she got going. When my father’s mother died, I selected as a keepsake a battered red mixing bowl she used to make fudge. She was particular and indulgent on the item of sweets. I remember the thermometer, her modulated voice explaining to me the science of candy making, her delight when appreciative guests asked for more. I got her bag of yarn, too, mostly because no one else wanted it. She used to crotchet padded clothes hangers–pretty things to hang in closets, where no one would see them, of course. I was delighted to find at that bottom of her bag a pile of butterscotch hard candy she was not supposed to eat in her last years because of her diabetes. She sneaked while she worked. I keep the candy there as good luck charms. My grandmother's bedspread, on my bed now. 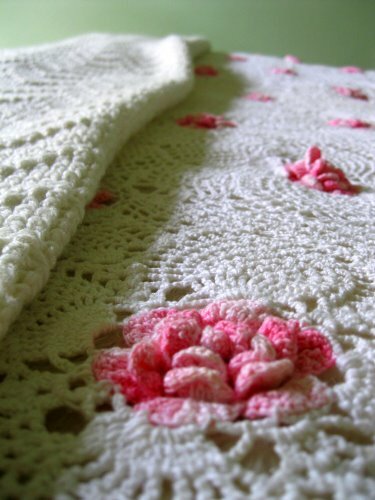 From my mother’s mother I have a bedspread that took her five years to make. By the time she completed it, the instructions were held together with yellowed cellophane tape. She crotched 159 three-dimensional pink roses, 18 petals each, every flower set into a lacey square, each square woven into the next. The thread was thin and easily tangled. It was likely the most impractical thing she ever did. The spread needed repairing even before she finished the last row. She no doubt agonized over what she had gotten herself into with the project and thought a good many times about giving up. I’m guessing she kept on because she visualized tying the final knot and laying her masterpiece upon the old mattress. I wish I had been with her at that moment to see her face. The roses and the intricate pattern holding them together seem as fine as any bloom or design I can put in my garden or might write. I keep the spread on my own bed now. If I hold my head just right, my eye even with the flowers my grandmother made, I can see a landscape I like to think she wished would go on forever. Ah, I remember Grandpa being the gardener. He had complicated watering systems that he had engineered himself for his garden on the garage/patio roof , rhubarb down below, along with beans growing up strings to the roof. Grandma? I remember her in the kitchen. Rarely did I see her outside of the kitchen. 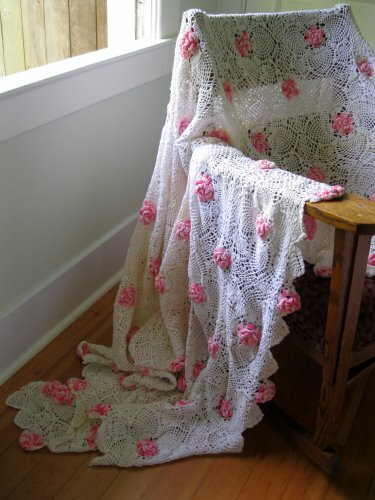 I was fortunate to inherit her black throw with brightly colored granny squares and the picture of the boy standing on the bridge that used to hang above their sofa. 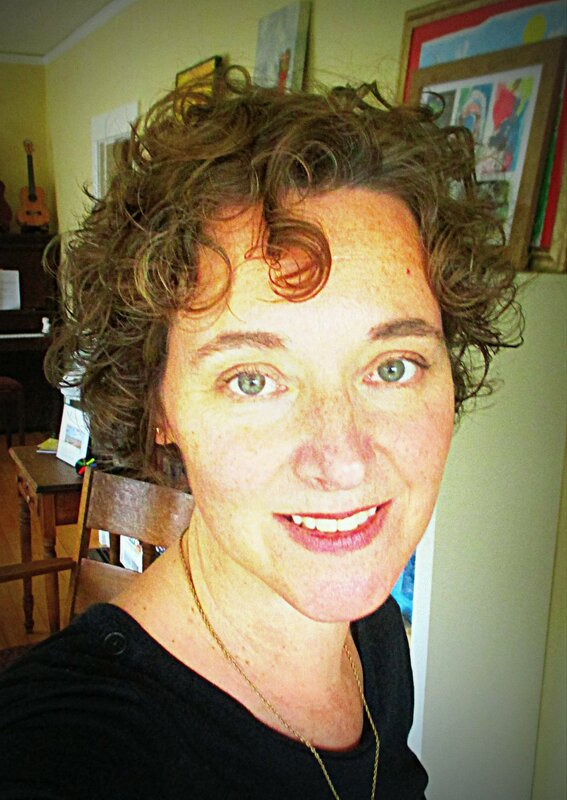 Kathy, you write beautifully – thank you for sharing with us! Marsha, I loved how Grandpa got into gardening when he was older! I saw some of his projects at your parents house. I remember Grandma in the yard, but I agree she was often in the kitchen. Once I came out into their backyard and saw grandma and grandpa sitting on the top of the picnic table staring out at their summer backyard, the flowers in bloom, birds everywhere. Their backs were to me, and his arm was around her. It is one of my fondest memories of them together.